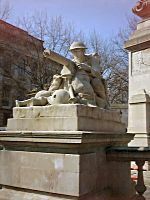 The Cenotaph in the Guildhall Square comprises of two memorials - one to the dead of World War I and one to the dead of World War II. It is accessible at all times. Panel 1 - Abbinnett A. to Crawshaw H.
Panel 2 - Creasey F. to House W.
Panel 3 - Howard J. to Parsons B. Panel 4 - Parsons E. to Waight F.
Panel 6 - Abbingdon J. to Cooper F.
Panel 7 - Cooper F.E. to Harvey L.J. 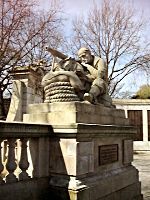 Panel 8 - Harwood W. to Mitchell G.
Panel 9 - Mitchell H. to Shepherd H.
Panel 10 - Shepherd L. to Younghusband H.
The World War I Memorial includes two sculptures of machine gunners by Charles Sargeant Jagger (1885-1934), an artist who was a veteran of WW1 and a recipient of the Military Cross. He was wounded at Gallipoli, and again, near-fatally during the Western Front campaign of 1918. Photographs, with their associated plaques are below. THE DUKE OF CONNAUGHT K.G. COUNCILLOR JOHN TIMPSON K.S.T. J.P. This white stone plaque on the pedestal to the North Gunner was paid for by Portsmouth City Council and unveiled on 6 November 2003 by Mrs Madeleine Dunn who heads the Portsmouth War Widows. 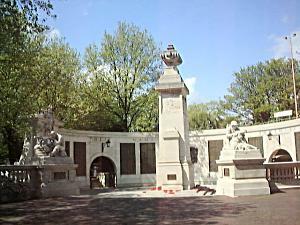 Preparations for the construction of the Cenotaph began almost as soon as the Great War ended, but it was not until 1920 that invitations to subscribe to the cost were made. A list of all who donated money and the amounts they gave is held at the Central Library in Guildhall Square. 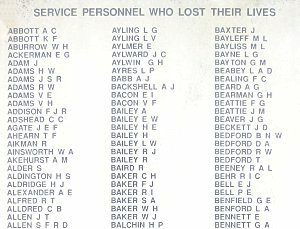 At the same time, local people were asked to nominate the service persons whose names should appear on the memorial, the criteria being 'That the man was born in Portsmouth, (or) that he resided in Portsmouth when the war began, (or) that his home was in Portsmouth when the war began'. Great stress was laid on the concept that 'Not a single name should be omitted', however a perusal of the local parishioners memorials shows a considerable discrepancy on this matter. For 60 years following the end of World War II the only memorial to the men and women who lost their lives was a low stone wall at the rear of the Cenotaph with the words 'IN MEMORY OF THOSE WHO LOST THEIR LIVES IN WORLD WAR II 1939 - 1945' inscribed upon it. On 8th November 2005 a new WWII memorial was unveiled by Princess Alexandra. That this memorial should exist at all is almost wholly down to the dogged determination of Jean Louth whose father Harry Short had died on the beaches of Dunkirk. It was Jean Louth with the help of organisations such as the Normandy Veterans Association and the Portsmouth South Branch of the Royal British Legion who lobbied for funds to raise this memorial. 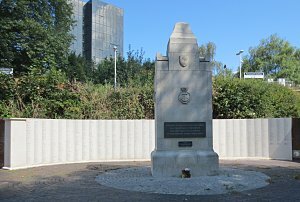 This though was only the first phase as Jean was determined that the names of those who died should be included on the memorial and it took a further eight years to raise the funds necessary to inscribe and raise the twelve panels of names. Some panels were individually sponsored by Wightlink, Veolia, Parkwood Leisure, John Paul Getty Jnr., WH Hooper and CRC.